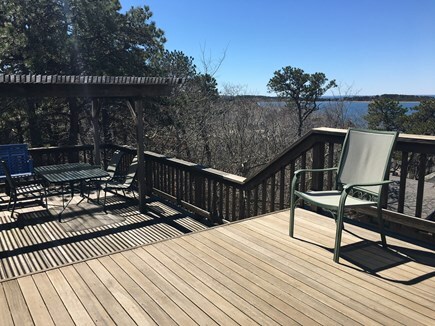 Enjoy expansive views of Cape Cod Bay and Great Island from our 2-level deck as well as from the open kitchen/living room. Our lovely house is located high atop Nauhaught Bluff in a quiet neighborhood. The sunset views from the deck are spectacular. There's also a front deck with a sitting area and umbrella to sip your morning coffee, or to appreciate the shade in the early evening. This is an ''upside down'' house designed with bedrooms and full bathrooms on the ground floor, and the open living, dining, kitchen on the second floor to take advantage of the great views. 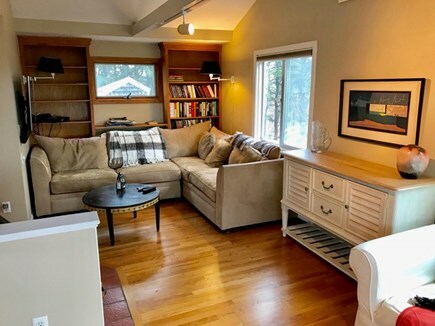 Our family just purchased this wonderful, unusual contemporary home in the fall of 2016, fulfilling a 40-year dream of owning a home in Wellfleet. This year-round home was in move-in condition, but we have been busy making some cosmetic changes. Please note that we will be adding new photos as we progress through this process. 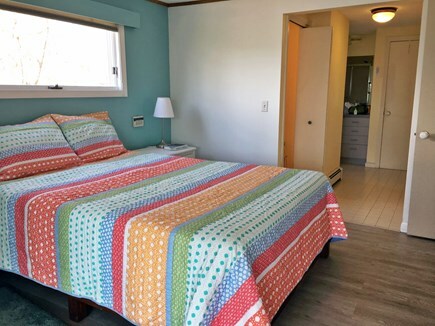 The roomy house easily accommodates six people. The three bedrooms are on the ground floor. Master suite has its own bath and shower, and there's another full bath on this floor for the 2 other bedrooms. Two bedrooms have queen beds, and the 3rd has two twins, which can convert to a King. Master suite has sliding doors to the screened porch facing the Bay. There's a separate room with washer, dryer, and supply closet. Upstairs is the large open kitchen, dining area and living space with hardwood floors. Two sets of sliding glass doors open to the two-tiered deck facing west to the Bay. The half-acre lot is surrounded by trees with views that make you feel as if you're in a treehouse! 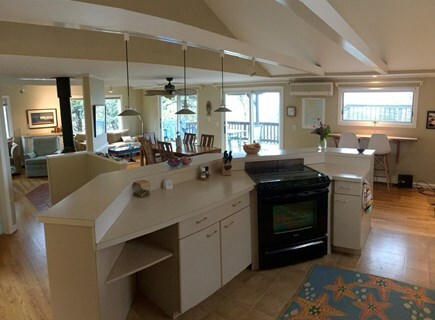 The fully-equipped kitchen is huge with lots of counter space for those who love to cook. There's a separate walk-in pantry as well. The high-pitched ceiling with rafters and many windows and sky lights provide the bright open feel. The cozy living area with Flat-screen TV and fireplace includes a comfy L-shaped couch which opens up to an additional Queen bed. 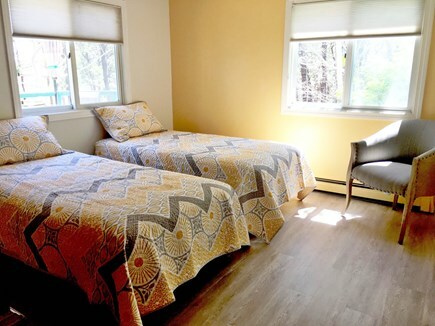 Many other amenities include a roomy outdoor shower, two air conditioning wall units (one on each floor) a quiet benched sitting area on the grounds under trees. And, it's just a 3 minute walk to the beach on a deeded path. 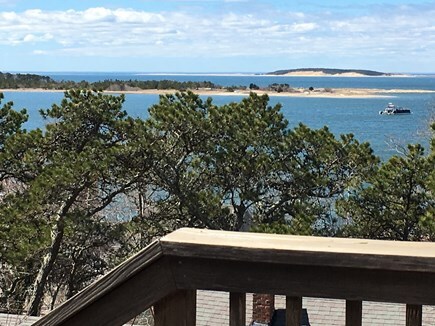 From the house you can take a lovely walk to Wellfleet Center along the beach, through a forested path and across Uncle Tim's Bridge to Wellfleet Center with all its galleries, restaurants and shops. 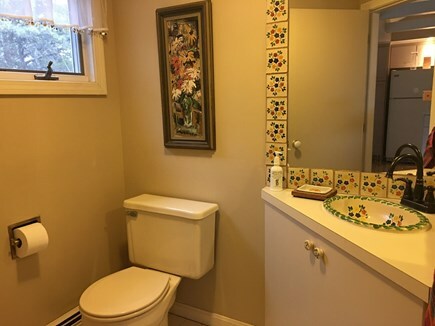 The house is close to everything -- Near Route 6, between Eastham and Truro, and 20 minutes south of Provincetown. 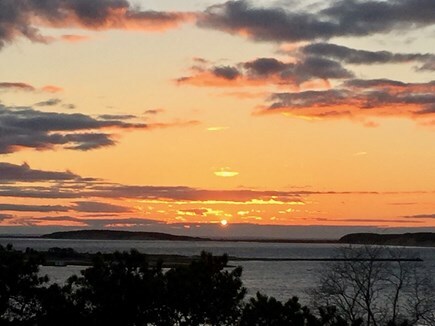 There's no end of activities available to you -- from the four beautiful ocean beaches on the National Seashore, to the many freshwater ponds, bay beaches, hikes on Great Island and National Audubon Sanctuary. For foodies, cook fish fresh off the boat at home on The grill, or eat out at many of the fabulous restaurants. Additional pricing info: Cleaning fees per week $200. State and local taxes of 12.45% will apply. Leaving today after 2 weeks in Wellfleet. This home is perfect! Great location close to bay, beach and town. Beautiful home filled with every amenity. Cozy living room, stocked kitchen, 3 comfortable bedrooms. Lovely grounds with a zen type garden and deck overlooking the bay complete with lounge chairs, table, etc. We totally enjoyed ourselves in this clean, comfortable home and will definitely be back! 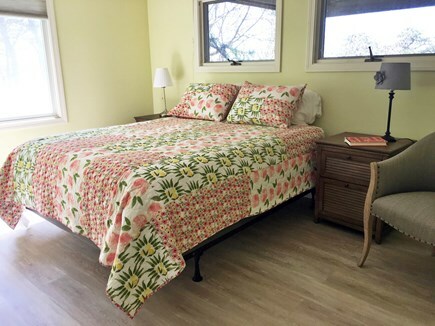 Thank you so much for your positive review of our home in Wellfleet. I’m so glad you enjoyed your two weeks and I hope to see you with us again. You were wonderful renters. OK, we loved it!!! Starting with the house and continuing with the Wellfleet area. The owner was very friendly, easy to communicate with and accommodating. Plus there is a house manual telling you all that you need to know concerning use of the facility and where they liked to go. A folder of menus from local restaurants is provided. For those of us traffic averse, the Sunday to Sunday rental makes life much easier particularly getting to the start of your vacation. The house was stocked to include all paper products and all you would want in terms of amenities plus the expected full kitchen and baths. Bring sheets and towels of your own because they are not provided. This is minor because at other rentals we have "rented" the sheets and towels. There are so many porches and spaces that you can be together as a family and/or get quiet time. Beach chairs are in the garage and a lot of appropriate outdoor furniture on the porches. 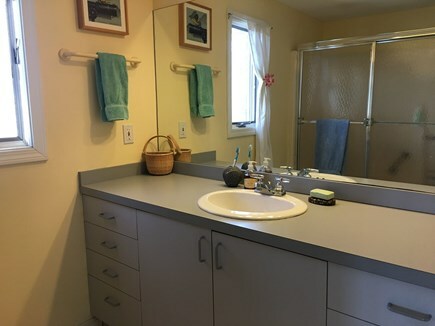 The location of the house is terrific- simple access to Rt 6 and just a brief walk to the bay. 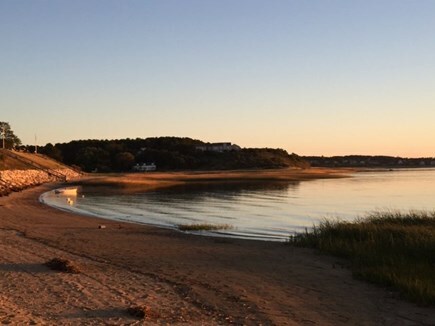 Walking along the bay to downtown Wellfleet takes 20 minutes. For those addicted to being connected, instead of being on vacation, you will be fine as wifi and hard wired are both available, along with TV and Netflix (helps with teenagers). We had breakfast every morning on the porch (2nd story porch off main living area and kitchen). We wanted the ability to control the pace of our vacation and found the location of the house very useful for spur of the moment decisions (head to P'town National Beaches or go out to Rt. 6 and find a clam shack - real clams not the strips). Restaurants in the area are very good -- not cheap but very good. We also easily were able to spend a day on Nantucket- definitely bring your wallet- which was our only completely planned activity. There is summer theater in Wellfleet- enjoyed that. We were there during July 4th week and did not find it too crowded at any level. If you are a senior citizen (I am) you can get an "America the Beautiful" Senior Lifetime pass for $80 at any of the National Seashore beaches. This provides free access to all Cape Cod National Seashore beaches AND all US parks in the United States for the rest of your life. Thank you so much for your wonderful review! 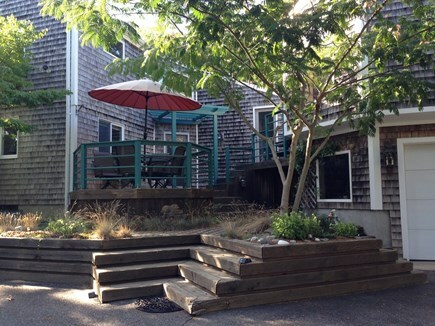 I’m so delighted that you enjoyed the house and Wellfleet and the beautiful area. And that you’re coming back next year for the same week!!! Very nice home in a quiet location. The home was very well stocked with essential items. 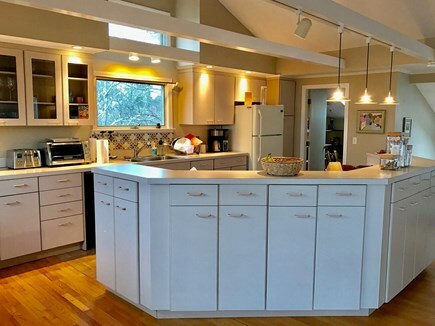 The owner prepared a detailed and informative manual on how to use appliances, take care of recycling & garbage pick up, things to do in Wellfleet, etc. The homeowner was easily accessible by email.